Almost everyone met with password protected winrar file.For example, you have downloaded movies or something else from torrent or rapidshare, and when you try to open the downloaded file appears “Enter password for the encrypted file”… Damn… What now…You can decrypt the password of the .rar file with RAR Password Cracker. I´ve tested and have broken password with 3 charachters for 60 seconds. 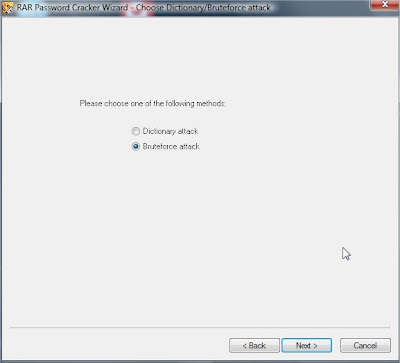 How to use RAR Password Cracker? You can use a dictionary attack and a brute force attack.I prefer brute force. Brute force actually means to start with a letter a and encrypting it. Then see if the encrypted strings match. If not then b, c, … until we’ve gotten . Then the encrypted strings will match and we’ll know that is the right password. Brute force attack is the slowest method of cracking, but there is no risk that you’ll not find the password. The thing about brute force is that the time of cracking rises rapidly depending on how long the password is, how many characters are being used in it and so forth. 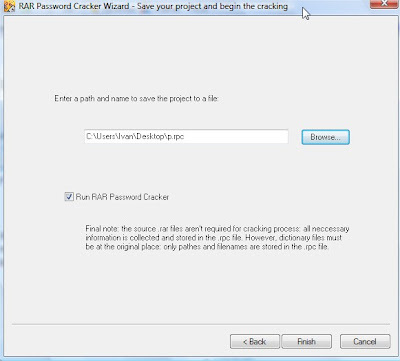 To crack winrar password follow steps below. 2.Load Rar file , which you want to decrypt and add to project. 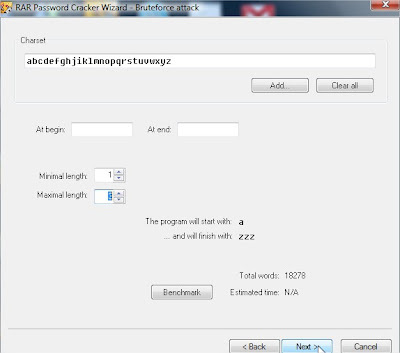 4.Add charset and set password length.